Like a spectre, the Middle Income Trap stalks China and the rest of the world’s successful emerging economies. This Trap says that no matter how fast-growing initially, all emerging economies will slow. The proposition that fast-growing economies will slow eventually is called “neoclassical convergence” — when capital-deepening has run its course and any further advance in prosperity can come only from technological progress, whether through indigenous innovation or through importing techniques from any economies still running on ahead. But neoclassical convergence is an old idea. Moreover, its prediction is that slowdown occurs when emerging economies smoothly and gradually catch up with and achieve equality with the advanced ones. In contrast the newer hypothesis of the Middle Income Trap puts forwards two further claims: first, that the slowdown occur with a bang, not a whimper; and second, that the economy in question slows long before it attains parity with rich countries. For studying the Middle Income Trap, certain evidence is obviously unhelpful. For example, a sudden slowdown that occurs in a rich country: It matters hugely for economic policy in that country whether that slowdown has occurred because its labour markets have grown sclerotic, or its financial markets have seized up, or the entire economy has become uncompetitive in a globalized world. But such a slowdown is irrelevant as evidence on the Middle Income Trap. Asia Development Bank, 2011. Realizing the Asian Century. The Asian Development Bank provides a dramatic graphic on this. The World Bank provides another. This World Bank evidence, of course, is consistent with and elaborates usefully on the ADB example. Here, the 45-degree line shows economies that by 2008 were only in the same position relative to the US as they had been in 1960. Thus, although those economies grew, they did so only at the same pace as the most advanced economy. For these economies, the advantage of backwardness, the picking of low-hanging fruit, the catch up that was supposed to happen — none of these helped. Economies appearing below the 45-degree line did even worse — they fell even further behind even when starting out relatively poor, i.e., even when they were the ones that could ill afford to do so. 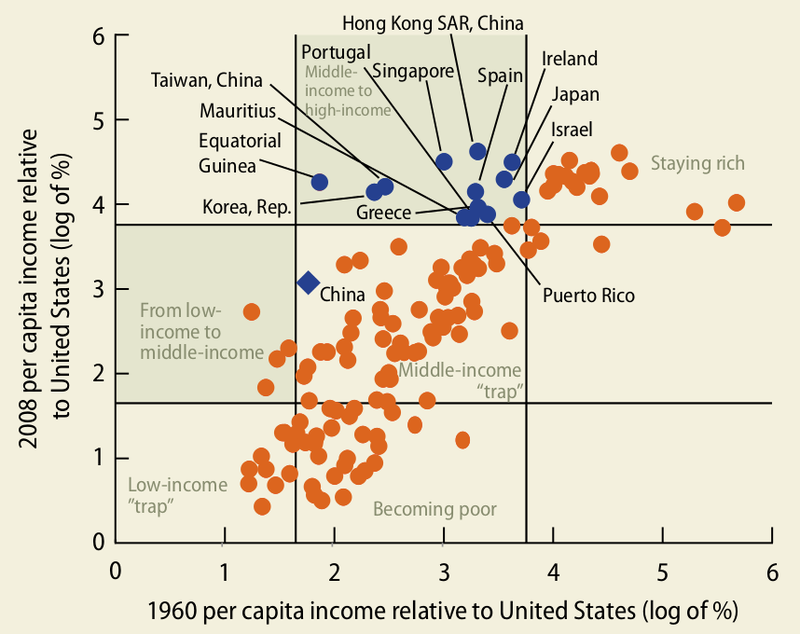 The World Bank report says this Figure shows how if one divides up relative incomes, not unreasonably, into groups of low, middle, and high, then by 2008 only 13 economies had managed to break out of the Middle Income Trap, from the 101 already middle-income in 1960. Stephanie Flanders read between the lines of the World Bank’s report to bring out what the World Bank would not explicitly announce. This is the chart that sounds the clarion call: China cannot hope to evade the Middle Income Trap without becoming “more like us”. For the policy-makers seeking to tease valuable lessons out of the escapees: Group 2, the PIGS economies, is almost surely not where one would want to go. Group 3, I hope other observers will be able to find useful commonality; I cannot. Group 1? Things actually look pretty good for China. 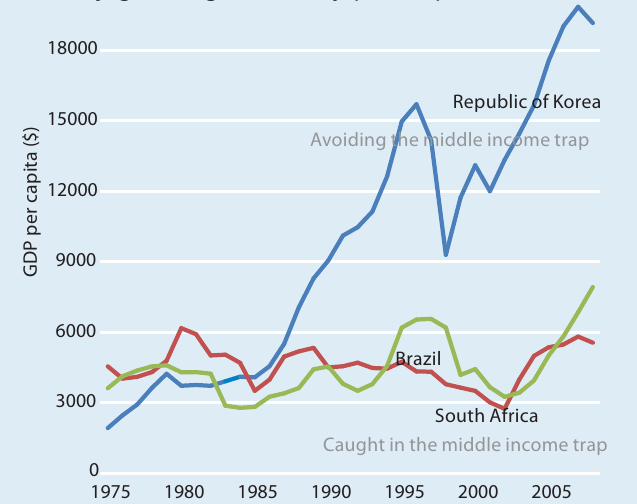 5 Responses to "China and the Middle-Income Trap: Indiscriminate Tuna Fishing"
Certainly growth tends to slow as countries move up the wealth scale, and certainly some countries suffer dramatic slowdowns that leave them "trapped" at a more or less static level of development. But the latter happens to poorer and richer countries just as often as to mid-income countries. Traps are everywhere. I agree. This makes a lot of sense. Many people seem to think the opposite and it's likely hopeful that you and I (and others who see through this) continue to speak out. Funny, I thought the middle income trap was that they are the tax donkeys who support the non-working poor and the non-taxpaying rentier class.